Lancaster City striker Tom Kilifin. Lancaster City will welcome one key man back this weekend after learning another could be ruled out for six weeks. Striker Tom Kilifin has returned to the fold after being the subject of interest from Kendal and is set to feature against Scarborough Athletic at Giant Axe on Saturday. The Dolly Blues will however be without Ryan Winder after the midfielder picked up a slight groin tear in the final few minutes of the defeat to Harrogate which could rule him out for six weeks. Boss Darren Peacock said: “Tom was at Saturday’s game (against Harrogate). “We talked afterwards and he said he wanted to come back. “It’s a big boost for us. He’s a really popular character in the dressing room. “It’s a shame about Ryan though, he’s been really good in recent weeks. As well as Kilifin’s return Peacock is also hoping to secure the signature of Garstang striker Matty Poole by the weekend. The former Morecambe youngster is the top goalscorer in West Lancashire Premier Division with 17 goals so far this season. He is also registered with Kendal but is expected to be released by the Mintcakes to allow him to join City for what would be a second spell at Giant Axe. 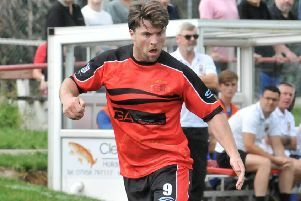 The need for fresh blood up front was highlighted again in the 1-0 reverse against Harrogate at Giant Axe on Saturday. Peacock said: “It was very frustrating. “It’s a big time for us in December and January but we’ve not made a good start. “We’ve got time to pull it back, starting with Scarborough, but it was the same issues again on Saturday. “We played well, especially in the second half, but we’ve got to start taking our chances.